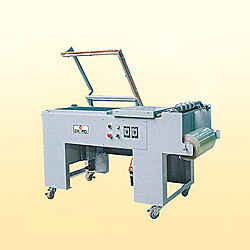 Manufacturer of Packaging Machinery & Overwrapping Machines. 3. Impulse type sealing and cutting, has quick speed and saving electricity. 2. Sealing length (L x W): 600 x 450 (mm). 3. Max.product height (mm): 200(mm). 5. Heater: 1,000 W impulse. 6. Machine size (L x W x H): 1,500 x 820 x 950 (mm). 7. Case size (L x W x H): 1,700 x 1,020 x 1,200 (mm). 8. N.W. (kgs) / G.W. (kgs): 100 /180.